Are you interested in making your own clothes at home? 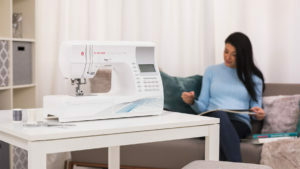 Are you searching for the perfect sewing machine for the job? If you’re ready to make your creative visions come to life and personalize your wardrobe, your first task will be getting a great machine. There are many benefits that come from creating your own clothes. Maybe you already have an idea of which type of machine you want. Maybe you’re buying a machine for your relative or are completely new to sewing. Whatever the case, the traits of a quality machine are non-negotiable. Your machine needs to have quality ergonomics, be sturdy yet lightweight for easy transportation, and it must provide adequate light to work with. In addition, it has to fit into your sewing space, have a pressure foot that easily responds without stalling, and controls that are user-friendly. The displays must be readable and ideally, multiple layers of material can fit under and around the machine’s pressure foot.